Designed for use with most BW single-gas and multi-gas detectors, the Sampler is an ideal confined space entry accessory. 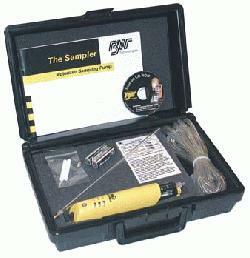 Simply attach it to your detector and activate for continuous remote sampling. With a rugged pump and a robust, ergonomic design, the Sampler features intelligent diagnostics that tell the instrument when to calibrate itself. Motor speed is self-regulating to provide consistent airflow in ever-changing environmental conditions, and a 30-hour runtime on 2 AA alkaline or NiMH batteries ensures trouble-free operation through multiple shifts.